Crimp beads are used with all beading wires to secure the start and finish of the strand. The wire is threaded through the crimp bead, around the clasp loop and then back through the crimp bead. The crimp bead is then crushed flat (using flat nose or crimp pliers). Crimp beads can also be used on each side of a “floating” bead to hold it in place on flexible beading wire (such as Soft Flex or Beadalon), transparent beading thread or cord. Use crimping pliers - the look is much more professional, and the curving of the beads makes it smoother, so those wearing the jewelry wont feel any sharp edges. Crimp beads can come as either beads (round beads) or as tubes: it is a matter of preference which you choose. 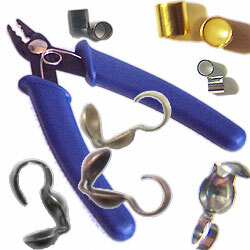 The crimp tube is generally more popular as they are much easier to secure. Crimp beads can be used in the place of a bead tip (aka charlotte crimp) or in addition to the charlotte crimp in order to help keep the knot inside of the charlotte crimp. You can use a crimp bead in finishing a wire or thread.